Mitsubishi Pajero Sport to be launched on 13 March! Mitsubishi will launch the new Pajero Sport on 13 March 2012. It will replace the ageing Pajero SFX which the Japanese car maker has stopped selling officially. The Pajero Sport is expected to be launched on March 13th, 2012 according to Mitsubishi dealers and will likely be priced at about Rs. 26 lakh. The Pajero Sport will be offered only in one 4×4 variant unlike the segment leader Toyota Fortuner which comes in both 4×2 and 4×4 variants. The Pajero Sport is a lot more contemporary than the Pajero SFX. The Pajero Sport has a radically designed front grille with unique vertical slits that makes the SUV look brawny and aggressive. The clear lens headlamps with projector beams are attractive. The front and rear skid plates make the Pajero Sport off-road ready. The Pajero Sport stands on 17-inch wheels, features a high ground clearance of 215 mm and large wheel arches which further enhances its sporty side profile. Like most contemporary designs, the Pajero Sport has a tail lamp cluster that extends onto the boot door giving it a premium feel. The rear bumper has integrated rear fog lamps, reflectors and reverse parking sensors. The Pajero Sport is as big as the Fortuner particularly in length, height and wheelbase. The Pajero Sport will have seven seats laid out in the 2+3+2 arrangement. We expect the Pajero to be as spacious as the Toyota Fortuner if not more. The interiors of the Pajero Sport will be generations ahead of the outgoing SFX in terms of quality and fit and finish. The dashboard layout will be similar to that of the Mitsubishi Outlander. The interiors will have a premium feel and will justify the Rs. 20 lakh plus price tag of the Pajero Sport. Overall, with high quality plastics and a spacious cabin, the comfort level of the Pajero Sport will be significantly higher than that of the Pajero SFX and will be at par with the Fortuner. Mitsubishi will likely equip the Pajero Sport with a 2.5-litre common rail diesel motor that puts out 178 bhp of power and 400 Nm of torque. As per specifications, the Pajero Sport engine puts out more power and torque than the Pajero SFX which is powered by 2.8-litre turbo-charged diesel engine that puts out 106.5 bhp of power and 275 Nm of torque. The Super Select 4WD (four-wheel-drive) system featured in the Pajero SFX will be used in the Pajero Sport as well. This system allows selecting either rear-wheel drive or 4WD at speeds up to 100 kmph. Being built on a ladder chassis frame that is known for ruggedness coupled with Mitsubishi’s expertise in off-road SUVs, the upcoming Pajero Sport with its new powerful engine will likely perform better than the Fortuner when they go off-road. The Pajero Sport will retain the features available in the Pajero SFX. This includes dual front airbags, ABS, three row AC vents, front fog lights, rear wiper/washer, alloy wheels, height-adjustable driver seat, electric mirrors, remote locking, central locking, AC and audio system. The Pajero Sport may also come with touch screen navigation system and automatic climate control. There are speculations that the Pajero Sport will feature cruise control and steering mounted audio controls. 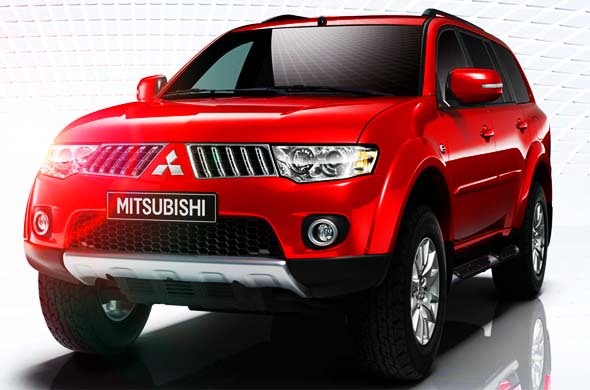 Mitsubishi SUVs are known for their SUVs with great off-road abilities and rock solid reliability. The current Pajero is an old working horse but fails when it comes to design due to its boxy exterior and dull interiors. The Pajero Sport not only looks promising, but could also deliver in terms of performance and comfort. However, Mitsubishi seems to have lost an opportunity because it is not assembling the Pajero Sport locally. This will have an impact in pricing the Pajero Sport which is speculated to be exceeding Rs. 25 lakh. At present, the segment leader, Toyota Fortuner is assembled locally and hence priced competitively in the range of Rs. 19.99 lakh – 20.99 lakh. With a weak brand image and scarce service networks, the Pajero Sport has a tough road ahead to clock consistent sales numbers. « Ford Figo gets interesting discounts as part of 2nd birthday celebrations!